Beautiful place furnished; on the road, and there are 3 km from the Castelo Branco highway ..
Site with 20 thousand square meters of green area. Great location, on the asphalt, with internet access, beautiful landscape, with privileged view of the Morro. The site has a total of 9 dorms, of which 02 are suites. 07 bathrooms, Living and dining room, kitchen equipped with 02 refrigerators, 01 freezer, 02 stoves, 01 of 6 mouths and 01 industrial, 01 barbeque hall with 02 grills, 01 pizza oven, living room with new SMART TV NET FLIX, 40 sets of tables with plastic chairs a wonderful balcony with hammocks, 20 thousand meters of green area, soccer field, volleyball court, playgroud, internet with wifi, SMART TV WITH NET FLIX, parking. A new swimming pool for adults and a new one for children, a vast orchard, with papaya, mango, jabuticaba, etc ... and vegetable garden. Place for parking, including for buses. Great for enjoying in-a-week with the family; for parties, retreats, meetings or trips. Infrastructure for up to 100 people for a single day and 45 for an overnight stay. Very green, pure air, silence and contact with nature. Ideal for those who like to wake up listening to the birds singing in the region. Lot virgin forest surrounding. The site is located within a farm with native forest and environmental preservation, suitable for nature walks and for those looking for rest in nature and can enjoy the whole infrastructure of the city of San Roque which has attractions and is visited during all seasons of the year !! 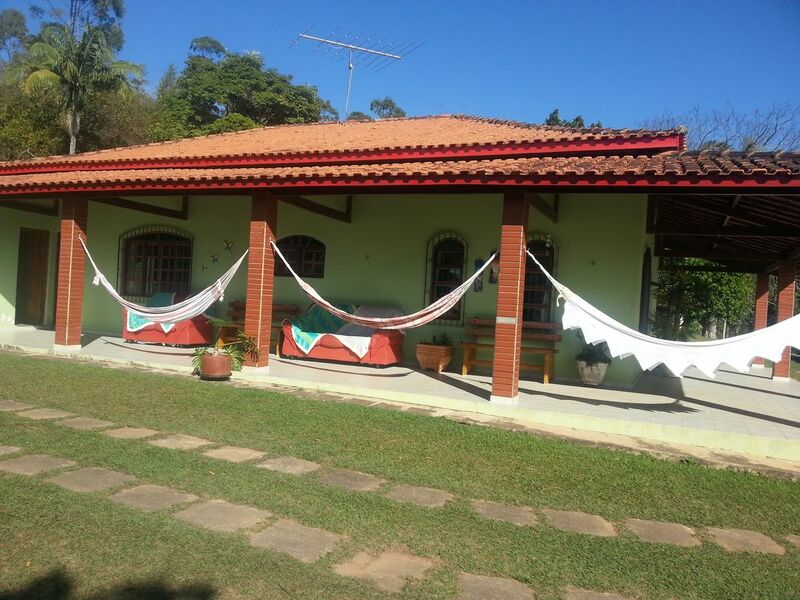 Located about 14km from the city of São Roque, it has an excellent infrastructure with good restaurants, a wide commerce and the most delicious wines of the region, fish-pays, artificial ski slope, etc. About 2km Catarina Fashion Outlet Access through Castelo Branco, exclusive outlet. ** Sao Roque ** is famous as the Land of Wine and a tourist resort. The visitor can make use of tourist services of local wineries and wine cellars, with excellent infrastructure, restaurants, shops, wine tasting, liquor and juice. Enjoy also to visit plantations, buying canned artichokes and producers, as well as tasting appetizing dishes based edible flower. San Roque is a region that receives tourism during all seasons of the year and one of the more times it is the month of October, when it happens Expo Sao Roque, dedicated to artichokes and wine. Visitors can also come across historical relics (constructions of the time of the Bandeirantes, as the Chapel of Saint Anthony, the Great House in pylon taipas 1681 Fernão Paes de Barros, etc. ), the quiet of country life and, for the adventurous, a park with the highest mountain leisure center in Brazil, with attractions such as skiing and snowboarding, ski lifts, slides, tree climbing, zip lines, paintball and mountain bike track. In the summer (holiday season) the weather is perfect with sun and heat during the day and extremely pleasant evening temperatures. In the autumn the landscape is beautiful and during the winter can be enjoyed a cozy and romantic atmosphere tasting good wines, founde, fireplace etc. In the spring the vegetation in the region is beautiful with many flowers, blooming ipês and an awakening with the song of the birds ... simply fascinating for the lovers of the nature !! 07 bathrooms, all with showers. quiet and reserved, yet close to the city center and highway. Muito bom, local aconchegante, limpo e espaço grande. Agradecemos ao casal Rose e Silvio que nos receberam com a melhor atenção possível, pessoas abençoada. Eu recomendo. Foi muito bom recebermos o Pastor Fabrício Clenio e os jovens da igreja assembléia de Deus, nos sentimos abençoados com a presença deste povo. É o nosso lema tratarmos os nossos hóspedes com amor e carinho, pois, são as pessoas mais importantes do nosso negócio. Aguardamos por vcs ainda neste ano. Como sempre nem tenho palavras para agradecer a Rose e seu esposo a atenção e o carinho que sempre nos recebe esse final de semana foi muito especial com amigos e família pessoas que nunca tinham ido no sitio amaram o lugar a organização MUITO OBRIGADO POR TUDO. Já estamos com saudades bjs e fica com Deus. Sônia, nós é que agradecemos mais uma vez,, foram tantas as vezes que locaram que já perdemos a conta. Ficamos felizes com o retorno que estamos tendo, pois nos esforçamos cada dia mais para proporcionar aos nossos hóspedes momentos maravilhosos ao lado dos amigos e da família! Que Deus continue abençoando esta família maravilhosa! Não tenho nem palavras para descrever a atenção e o carinho que a Rose e seu esposo recebem a gente tiver prazer de levar meus amigos e familiares para conhecer esse lugar todos amaram, um ótimo lugar para se divertir, descansar, um bom papo todos amaram. Bjs e ate Junho se Deus quiser. Gostaríamos de agradecer a Rose por toda a atenção dada a nossa família desde o primeiro contato até nosso “até a próxima”. O sítio é bem localizado, cômodo e atende muito bem o quesito diversão e lazer para a família, pensando não somente nos adultos mas também nas crianças. Com certeza voltaremos mais vezes. Nos é que agradecemos à família da Luana por terem escolhido o nosso espaço e por terem cuidado tão bem dele. Famílias como esta nos motivam a implementamos mais melhorias, para melhor atendermos aos nossos hóspedes, pois merecem a cada dia mais conforto. Obrigada Emerson por cuidarem tão bem do imóvel , vocêsforam ótimos como sempre. Como sempre não temos nem palavras para agradecer a atenção que a Rose e o seu esposo tem com a gente, deixando tudo limpo, organizado cada vez que vamos no sitio nos sentimos em casa, tudo em perfeito estado, lugar muito aconchegante. Super recomendo. Ate fevereiro se Deus quiser. Sempre que recebemos a família e amigos da Sônia e Sandra, ficamos felizes pois é um pessoal animado, zelam muito bem pelo espaço, fazemos o possível pra que a cada estadia desfrutem de algo novo no sítio. Já perdi as contas das vezes em que locaram, aliás pra nossa alegria já têm uma reserva pra fevereiro. Muito Obrigada a este grupo nota 1000! Just 5 km from the condo, lies Quinta do Pombal, at the exit to the Rod. Castelo Branco, km 57.5. The 53 Ranch (famous for Portuguese cuisine - at Km 53) and the Big House Restaurant, at km 54, are also nearby. Easy access to supermarkets, butchers and other trades. If you prefer, go to Araçariguama that is in the Km 50 of Rod White Castle. Easy access to hike up the hill Saboó. VALORES PARA FERIADO, NATAL, ANO NOVO E CARNAVAL SÃO DIFERENCIADOS, FAVOR CONSULTAR O PROPRIETÁRIO. O VALOR DE R$900,00 POR CADA DIÁRIA É PARA ATÉ 30 PESSOAS, ACIMA DESTE NUMERO DE PESSOAS, CONSULTAR O PROPRIETÁRIO.